​ The 2004–07 boom and bust in home prices and residential construction and the accompanying global financial crisis created a need for up-to-date economic indicators to help forecast changes in the residential construction sector. The Real Estate Center at Texas A&M University and the Federal Reserve Bank of Dallas collaborated to construct an economic index that estimates the timing and length of future upswings and downturns in Texas residential construction. Leading economic indicators frequently rely on future economic commitments, such as new orders for capital goods, or building permits. Some indicators, such as help wanted advertising, stock price indices and consumer confidence surveys, reveal expectations about future activity. ​​Leading indicator​s are analyzed to identify turning points in the business cycle. A good leading index will signal an impending upturn or downturn months before it actually happens. Leading indicators have the advantage of greater stability over time and across regions and sectors to predict changes. Some weaknesses exist in the estimation of leading indices. The underlying indicators are subject to revision, and while errors often cancel out across indicators, one must still be aware of how revisions impact the index and thus the future monitoring of the business cycle. In addition, although leading indicators often indicate the direction of a business cycle, they do not measure the magnitude of the change. Even with these caveats, leading indicators have served a useful function in measuring business cycles. Using the same methodology as the National Bureau of Economic Research (NBER), the Center identified previous business cycle turning points in Texas residential construction (Table 1). The Center's designation of peaks and troughs in conjunction with the residential construction coincident index indicator will be used to measure the business cycle. This makes it possible to construct a series that predicts changes in housing construction. 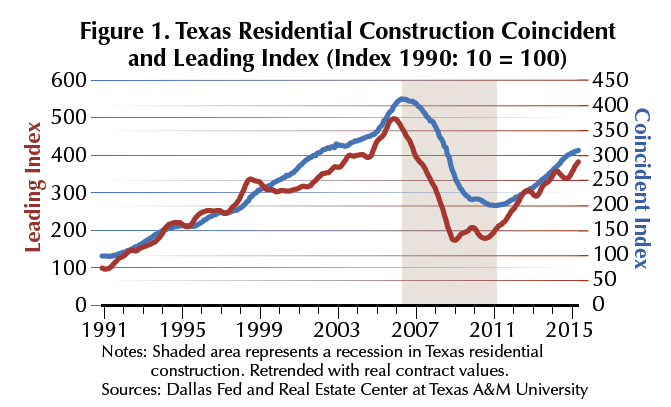 The differences in the business cycle between residential construction and the overall Texas economy were apparent during the Great Recession and the ensuing recovery. The Texas economy rebounded faster than the state's housing market, likely a consequence of the boom in shale oil exploration. currency or timeliness (how promptly the statistics are available). It is useful to examine variables specific to the dynamics of the residential housing market, such as changes in building permits and interest rates. 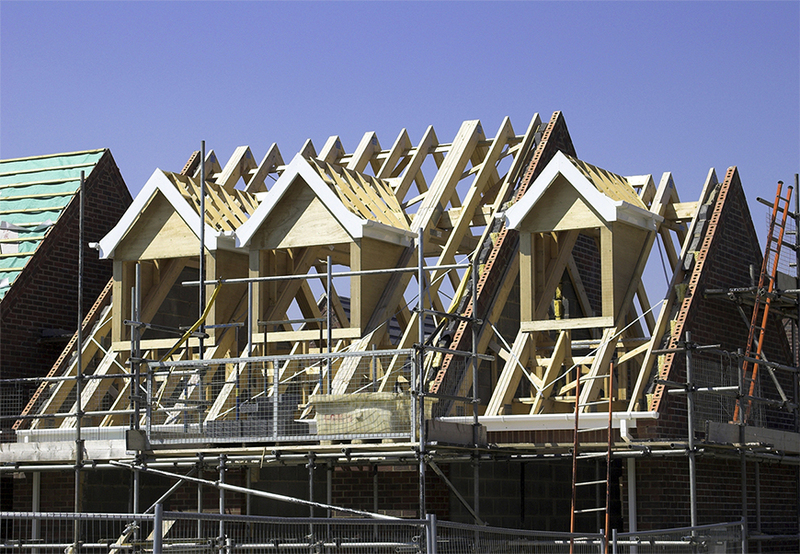 These are important factors in determining the level of housing activity. When creating a leading indicator, the measures of conformity and cyclical timing are given more weight. The Center used the same methodology as the Conference Board Leading Economic Index to measure conformity of a given series by studying the relationship between movements in the series and NBER peaks and troughs. The dates of the turning points are called reference dates, and the collection of reference dates is called the business cycle. This chronology identifies the peaks and troughs as expansions turn into recessions and vice versa. The cyclical timing of potential leading indicators is judged by simply recording how many months prior to a peak (trough) the coincident index reaches a maximum (minimum). To do so, each series is plotted against the Texas residential construction coincident index to see if they match previous peaks and troughs in the Texas residential housing market business cycle. A good leading candidate series is expected to rise during expansions and fall throughout contractions. If the candidate series does not demonstrate a statistically significant relationship to the business cycle, that series is not useful. Approximately 22 candidate variables were evaluated in the selection process. Eighteen are related to the Texas economy and four to the national economy. Four of the Texas variables — weighted building permits (weighted by average per unit housing values) for single and multifamily housing, housing starts, months of single-family inventory and median single-family household prices — are tied to the regional single and multifamily housing market. Four other Texas variables — nonfarm employment, construction employment, help wanted advertising for construction and maintenance positions and employment in architecture, engineering and related services — are tied to state and industry related employment. Three of the Texas variables — loan performance, negative equity, loan to value — represent regional credit conditions, while the housing opportunity index is tied to housing affordability based on income and financial costs to purchase a house. Rents and apartment vacancy rates are related to multifamily housing, a substitute for single-family housing. Texas leading indicators measure the outlook for economic growth based on the Texas business cycle. Real oil prices, well permits and rig count represent the energy sector, a key component of the Texas economy. Of the four national variables two — senior loan officer survey and lending conditions for acquisition, development and construction loans — represent credit market conditions. The housing market index, also available for the south region that includes Texas, is associated with builder confidence of those who build single-family houses. The last national series is the conventional confirming 30-year fixed mortgage rate, which represents the financing cost of purchasing a home. Based on statistically reliable criteria, two variables were selected as Texas residential construction leading indicators: weighted building permits and housing starts (Table 2). These variables demonstrated a significant leading relationship with the residential construction market in Texas. All other variables were found not to be statistically valuable for the leading index. 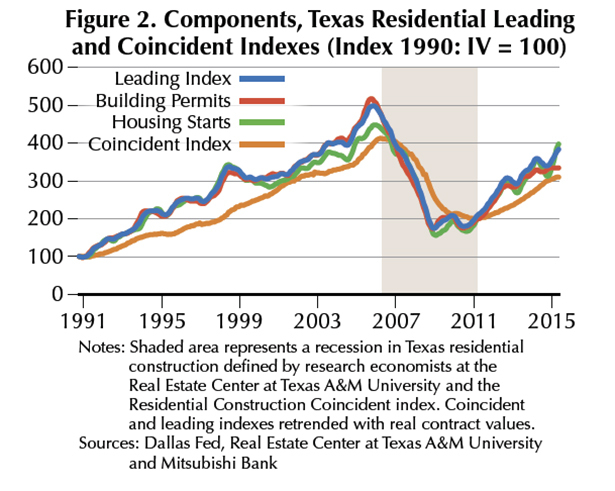 The Texas leading index for residential construction precedes the movements of the coincident index (Figure 1). The peak of the leading index for the housing bust led the September 2006 peak in the coincident index by eight months, achieving a maximum value in January 2006. A trough in the leading index led the April 2011 trough in the coincident index by 25 months, falling to its minimum value in March 2009 (Figure 2). Although the historical data includes a major downturn, it is fairly easy to note the occurrence of peaks and troughs in the leading index. It may be difficult on a month-to-month basis to detect turning points as a result of the volatility in the leading index (Figure 3). A common rule used by the Conference Board with the leading index is that three months of consecutive declines signal an upcoming recession and three months of consecutive increases signal an upcoming recovery. 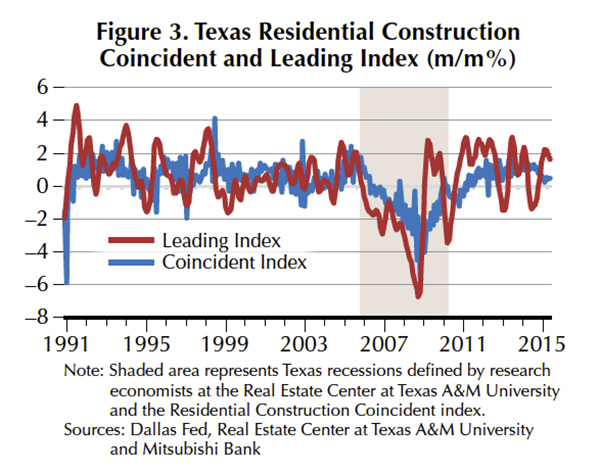 Overall, the leading index is seen to be a good indicator to predict changes in the Texas residential construction business cycle as measured by the coincident index. One major problem in evaluating the index in this study was the short duration of the period. To evaluate business cycle relationships, it is best to study the relationships over a long period and many business cycles. Because the coincident index starts in October of 1990, the period for this series to be evaluated was restricted (Figure 4). As each individual series was tested for its ability to lead the coincident index to the earliest possible date, no series could be tested prior to 1990. Because the predictive ability of the leading index was evaluated over a short time, the possibility always exists that the relationship might not hold in the future. Thus, the performance of the leading index for residential construction in Texas will be best evaluated based on its ability to lead the coincident index in the future. 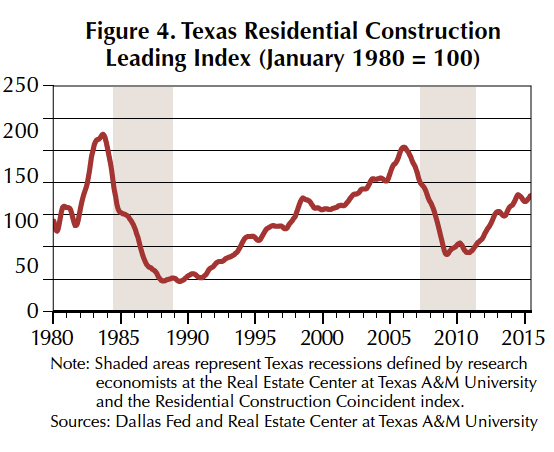 Even though the coincident index for residential construction starts in October 1990, the research economists at the Center have identified the turning points of Texas residential business construction since 1980. These turning points serve as a benchmark to evaluate the performance of the leading index back to the 1980s (Figure 4). For the peak date (May 1984) identified for Texas residential construction, the leading index achieved its peak eight months earlier (September 1983). A trough in the leading index was registered in February 1988, 13 months before the identified trough in March 1989. This demonstrates the usefulness of the leading index in predicting future movements in residential construction in Texas. Going forward, the Texas residential construction leading index should provide a reliable signal of weakness in residential construction, whether the growth declines or actually becomes negative. 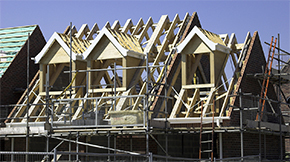 The leading residential construction index was able to signal a directional change in 2006 that became the prolonged downturn that started in 2007. It also signaled a downturn in 1983 in advance of the strong recession that hit the Texas economy as a consequence of declining oil prices. Even though the index has performed well, it is based on a relatively short period. The usefulness of this indicator will continue to be tested in the future to see if it signals directional changes in Texas residential construction. Currently, with data up to September 2015, the leading index is signaling a slowdown in residential construction activity caused by a deceleration in weighted building permits, contrasting with housing starts that register strong growth. Drs. Cañas and Phillips are with the Dallas Federal Reserve and Dr. Torres (ltorres@mays.tamu.edu) is a research economist with the Real Estate Center at Texas A&M University.